Will computers ever be able to make intelligent decisions based on the currently available information and previously acquired experience and knowledge? We are far from it, but progress is being made: Dr. Polikar leads the Signal Processing and Pattern Recognition Laboratory’s (SPPRL) research efforts on various computational intelligence and pattern recognition problems. 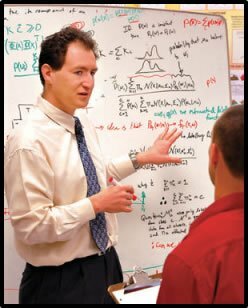 With continuous and generous funding from the National Science Foundation, Dr. Polikar and his students are developing new algorithms that allow computers to progressively learn from new data without forgetting the previously acquired knowledge, a concept known as incremental learning. He is also working on addressing the problem of missing features, a highly annoying yet real world problem of making intelligent decisions even when unreliable or partially missing data. Yet, another problem intimately involved with computational intelligence tackled at SPPRL is data fusion: the ability to intelligently combine and take advantage of information coming from multiple information sources. More recently, under a brand new grant from NSF, Polikar (pictured left) and his students are developing advanced machine learning algorithms that can learn from streaming nonstationary data, whose characteristics change over time. This is perhaps similar to learn how to play a game, while the rules of the games are changed without your knowledge. Applications of this scenario include spam detection (yes, you know what we are talking about – as spam detections algorithms get better, so do the spammers, and type and nature of spam are constantly changing), analysis of climate, financial, energy demand data, among others. SPPRL is also active in biomedical signal processing, such as early diagnosis of Alzheimer’s disease, and brain-machine interface, which are discussed below. Most recently, Dr. Polikar and Dr. Bouaynaya – along with colleagues Dr. Sukumaran and Dr. Wu have won a Major Research Instrumentation grant from National Science Foundation that brought South Jersey's first high performance (super) computer to Rowan. This resource, which includes over 50 nodes, nearly 1400 cores including GPU nodes and high memory nodes, with over 8000GB of RAM is available to SPPRL members. SPPRL also runs an additional 5-node machine specifically for SPPRL members and their projects. 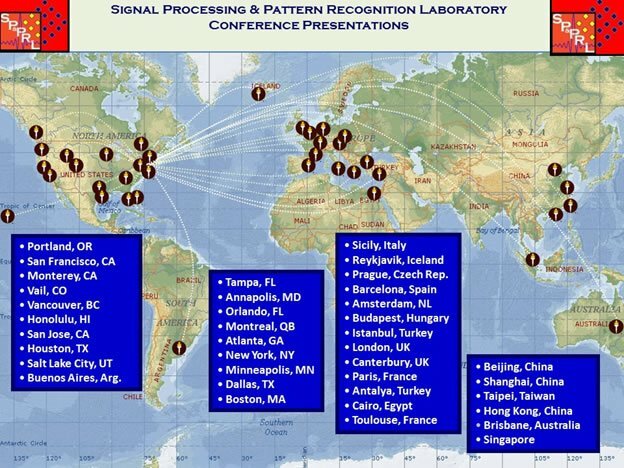 SPPRL members continuously push the boundaries of signal processing and machine learning research, and present their research results on prestigious conferences and journals. For a map of locations where SPPRL members presented their work, see the map below.